Recently I had the most wonderful experience that cannot be summarized in mere words. This experience was to say the least an awakening of the senses and a discovery of decadent self-indulgence. This was an experience in every sense of the word… one that was filled with the essence of fresh fruit and blooming flowers surrounded by luscious candy-colored hues with the aroma of perfumes and fragrances that conjure visions of sugar plums dancing in my head. Well as you’ve probably guessed, I absolutely adore LUSH Cosmetics, and it would be by utter destiny that one day I’d have an opportunity to host an event at this fabulous store. So, when the long anticipated chance to do just that arrived, I was so overcome with joy that I could barely contain my glee. And just like a kid in a candy store on Christmas eve, I was more than eager to unwrap each and every treat within arm’s reach. 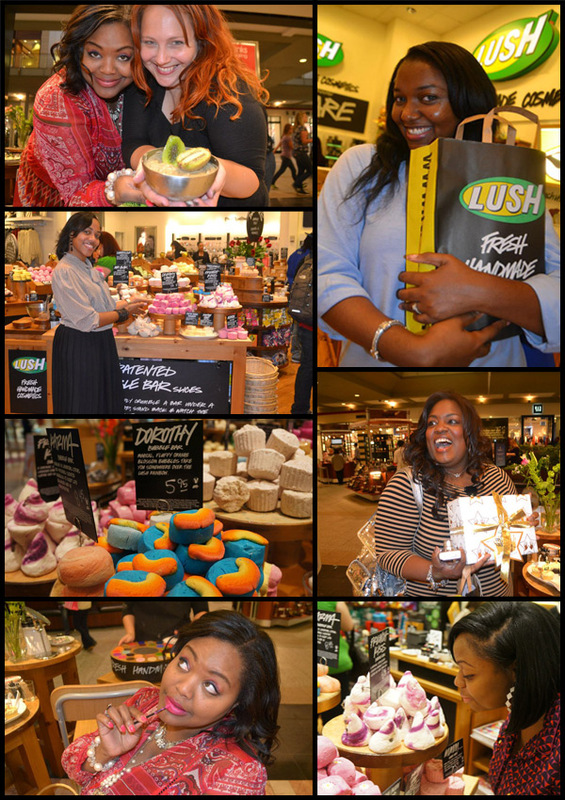 So, I gathered several of my besties (aka the Blog Fab Fashionistas (BFFs) and descended upon the LUSH store located inside Macy’s at Lenox Square for an evening filled with wonderful bath & beauty products, fabulous giveaways, goodie bags, and plenty of BFF fun! But, the talk of the eve was LUSH’s new Emotional Brilliance makeup line. What is it you ask? Well, LUSH has created a color wheel that allows you to choose your 3 favorite colors from the 32 possible choices to reveal the emotional state that color is associated with. This empowers you to choose your desired combination of colors that make you feel and look your best. How brilliant is that! I absolutely love the concept! Who knew that wearing a certain color would convey a specific emotion? Well, it looks like Lush has it all figured out. 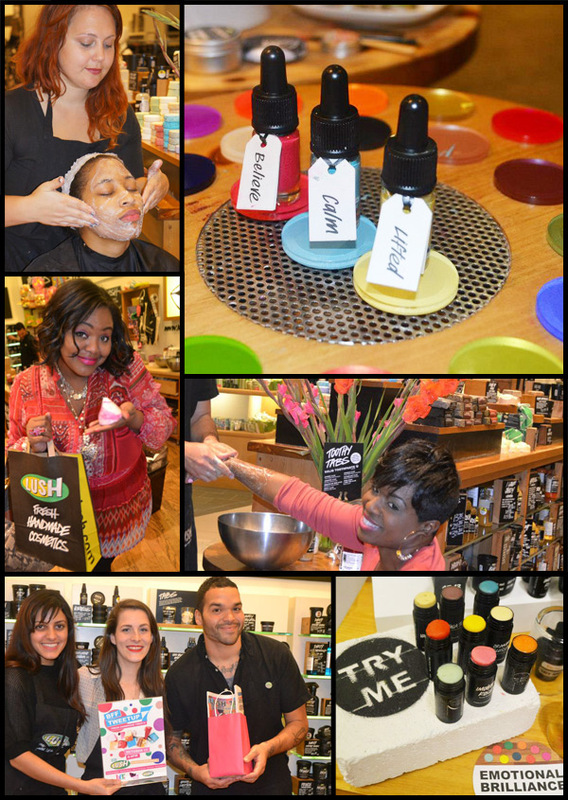 We had an amazing time discovering all of the new and exciting products at LUSH Cosmetics. Big hugs and kisses to Nicole and the fabulous LUSH staff for being such gracious hosts during our BFFTweetup event. The BFF ladies really enjoyed the pampering and product samples. Thanks to Beautiful Textures for the product samples, Vitamin Water for refreshments, and Fear4lymade Body Oils for providing the ladies with those lovely fragrance samples for our goodie bags. And of course I must thank my fellow BFF Divas for coming out in support. We had a great time like always! Be sure to follow these amazing ladies! Pssst… Wanna join in on a little BFF fun? 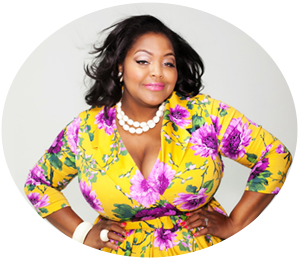 Signup now to become a BFF member at www.blogfabfashionistas.com. Oh yes… What a great time we had!!!! Awesome recap!!!!! I can’t wait to use my goodies!!! !